It’s that time of the month again! 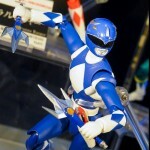 time for the Tamashii Nations Akiba Showroom to change out display for upcoming figures! On display right now are several recent reveals, these are the first actual non-official images we’ve seen for most of them as well. Are you all ready for brand new GARO this year? But before we move onto the new installments in this fast-growing franchise, the Makai Kado line has revealed two new releases from last year’s GARO: The One Who Shines in the Darkness. This special 2-pack contains golden versions of Flame Knight Zen and Heavenly Bow Knight Gai, who were enhanced with the radiance of Garo’s golden armor in the series’ final battle against Zedom. As well as replacement hands for the two figures, this set also includes a special backdrop for the two figures to be displayed alongside the soon-to-be-released golden version of the Ryuga Garo armor. 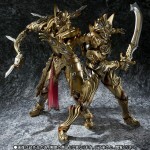 The 2-pack is a Tamashii Web Exclusive due for release in June, priced 14,040 yen.